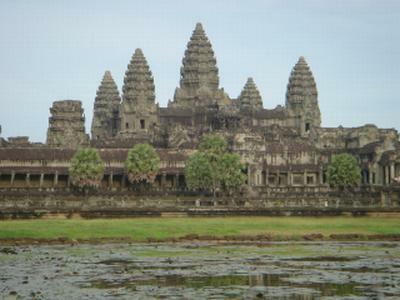 The Angkor Wat temple complex was built during the 12 century as king Suryavarman II's state temple and capital city. The Angkor Wat temple is the largest religious building in the world. The outer wall and moat stretches for 3,6 kilometres. Over the time it's affiliation has changed from Hindu worship of the god Vishnu to Buddhism. The temple is an icon of Cambodia, which is also used in the Cambodian flag. In the later years, huge restoration works have been done to the temple. After getting status as a UNESCO World Heritage Site in 1992, founds for this purpose has increased. This has also led to an increase in tourism. Today, more then half a million foreigners come to visit the temple every year. Beng Mealea means 'lotus pound' in the Khmer language. It was built as a hinduist temple. It is not certain excatly when, but it is asumed to have been built early in the 12th centuary, during the reign of king Suriavarman II. It lies 40 kilometres to the east of the main bulk of the Angkor temples along the ancient royal highway to Preah Khan Kompong Svay. 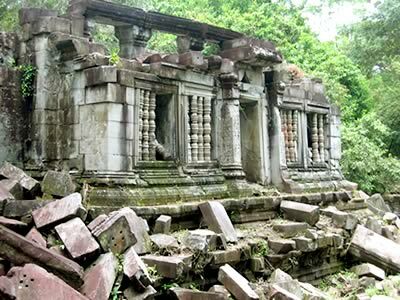 Even though most of the history of Beng Mealea is unknown, it must have been an important site. It was a large temple approximately 180 times 150 metres. It was in the core of a city, which had a 45 metres wide moat around it. It is now added to the UNESCO World Heritage list.